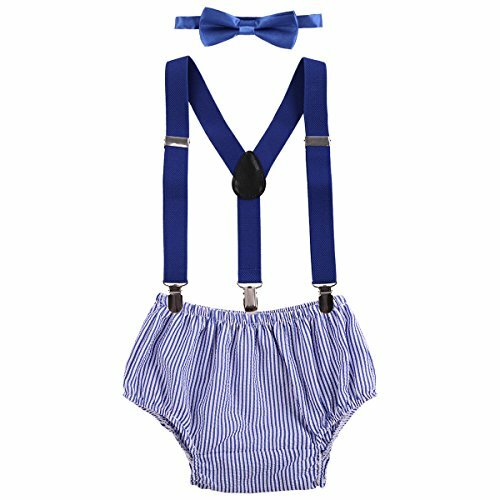 Condition:Brand New Material: Cotton + Polyester Color: ( as pictures shown ) Package Include: 1PC Pants + 1PC Suspenders + 1PC Bow Tie Specifications: Newborn baby boys pants, Y-back clip-on suspenders and bow tie 3pcs outfits. Elastic suspenders designed with 3 clips and 2 length adjusters. 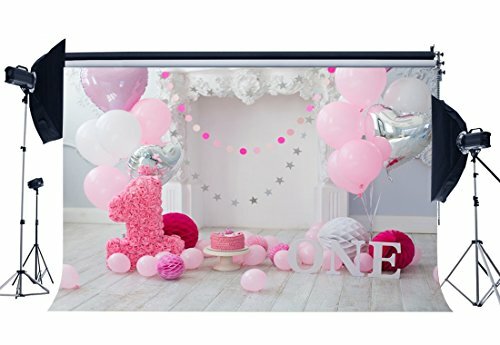 Perfect as photography props costume, makes your baby look so adorable and handsome. Care Instructions: Hand wash in cold water, line dry, do not bleach and iron. If you have any question about our product, please contact us, we will response you within 24 hours. Size: One size. The suggested age is just for your reference. Please check the detail size information in order to know whether the size fits your baby before purchasing. Pants: Waist: 15.5-21.0"/40-54cm Length (waist to crotch): 7.5"/19cm Suspenders: Max Length: 24.0"/61cm Bow Tie: Circumference: 12.0-16.0"/30-41cm Suggest for 3-24M. Harem Pants Set Size: Pants: Waist: 15.5-19.5" / 40-50cm Length (waist to crotch): 9.5" / 25cm Suspenders: Max Length: 24.0" / 61cm Bow Tie: Circumference: 12.0-16.0" / 30-41cm Suggest for 12 Months baby. Friendly Tips: The size is manual measurement, please allow minor error of measurement. Photo color might be a little different from the actual product due to color display of different monitors. 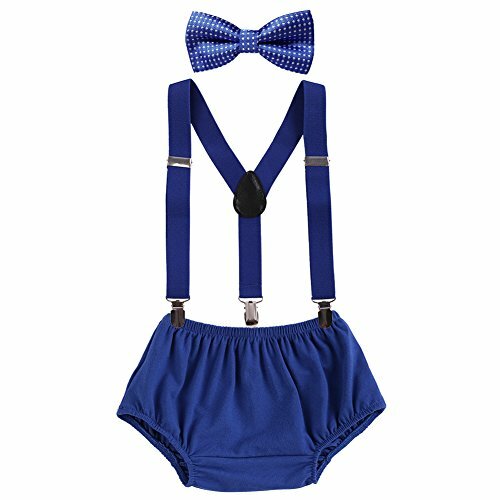 Package Include: 1PC Pants + 1PC Suspenders + 1PC Bow Tie Care Instructions: Hand wash in cold water, line dry, do not bleach and iron. Size: The recommended age is for reference only. The size is of manual measurement, please allow slight 1-3cm difference. Suggest for 3-24 Months. 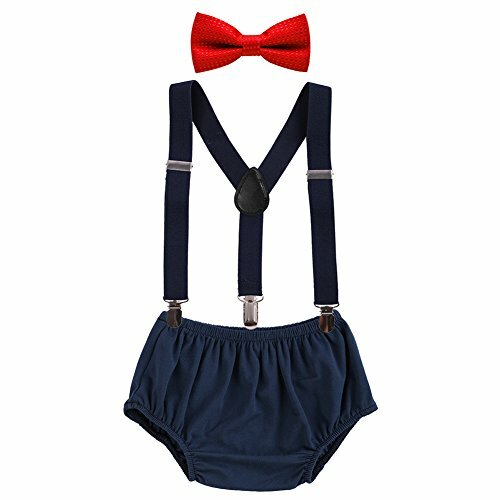 Suspenders: Width: 1.0" / 2.5cm Max Length: 24.0" / 61cm Pants: Waist: 15.5-21.0" / 40-54cm Length (waist to crotch): 7.5" / 19cm Bow Tie: Bowknot Width: 2.0" / 5cm Bowknot Length: 4.0" / 10cm Total Circumference: 15.5" / 40cm (adjustable) Photo color might be a little different from the actual product due to color display of different monitors. VERY IMPORTANT: Please supervise children wearing the bow tie at all times. There are small parts that contains choking hazard. Feel free to contact us if you have any concerns or questions. 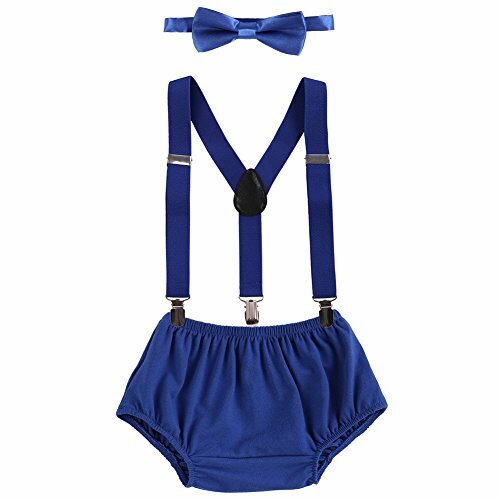 Package Include 1PC Pants + 1PC Suspenders + 1PC Bow Tie Care Instructions Hand wash in cold water, line dry, do not bleach and iron. Size The recommended age is for reference only. The size is of manual measurement, please allow slight 1-3cm difference. Briefs Pants (Suggest for 3-24 Months) Pants Waist 一一 15.5-21.0" / 40-54cm Length (waist to crotch) 一一 7.5" / 19cm Boxer Pants (Suggest for 12-18 Months) Waist 一一 16.5-22.0" / 42-56cm Waist to Crotch 一一 8.0" / 21cm Pants Length 一一 10.0" / 25cm Suspenders Width 一一 1.0" / 2.5cm Max Length 一一 24.0" / 61cm Bow Tie Bowknot Length 一一 4.0" / 10cm Bowknot Width 一一 1.7" / 4.5cm Total Circumference 一一 15.5" / 45cm (adjustable) Friendly Tips: Photo color might be a little different from the actual product due to color display of different monitors. VERY IMPORTANT: Please supervise children wearing the bow tie at all times. There are small parts that contains choking hazard. If you should have any question, please do not hesitate to contact us. Hi, Thanks for checking out our products. Aiden's Corner is a family-owned and operated business. All our items are handmade by us in Illinois, USA. Our goal is to provide premium infant apparel that are attractive and stylish. 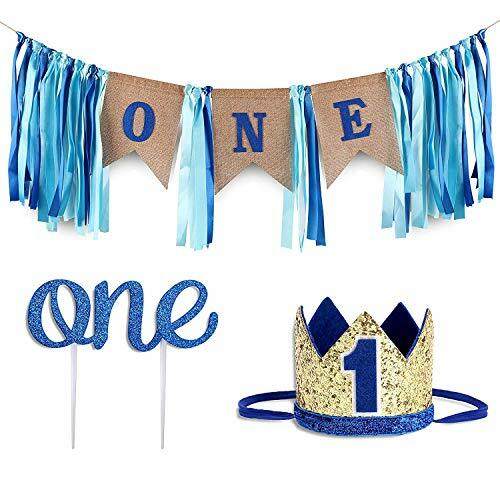 Made of the highest quality materials, these bibs are soft to the touch and made as a catch-all for baby's Smash Cake and 1st Birthday meal. Made with 100% combed ring-spun cotton premium jersey, our bibs are easily washed and made to last. VELCRO brand hook and loop closure for easy on/off. Our Birthday designs are made with high quality screen prints guaranteed not to fade or crack, our screen prints are hand pressed perfect for your precious little one's soft skin! 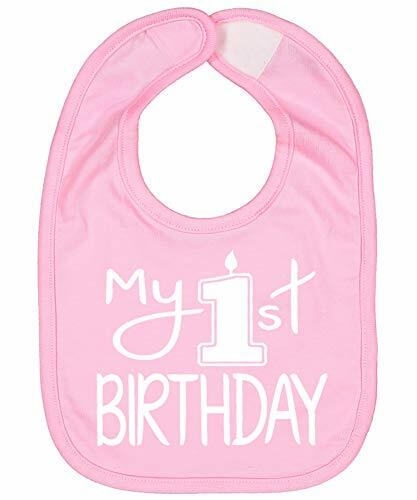 We guarantee a lot of laughter and fun with our Birthday Bibs, that's why our funny and cute designs make an amazing baby shower gift and a guaranteed hit at any party! Birthday Bibs Measure: 11" x 8"